The Islamic Republic has once again, in accordance with its savage Islamic laws, flogged Sakineh 99 times. The regime has used a picture published in the London Times of a woman, purportedly Ashtiani, without the Islamic hijab, as an excuse to flog her on charges of spreading corruption and indecency. The regime last week threatened Sakineh to be executed on Sunday August 29th. And of course both the execution sentence and stoning are still hanging over her head. Sajjad told the audience of today’s press conference in Paris by phone that he’s worried that by the conclusion of Ramadan this week, his mother would be executed. Indeed we are dealing with a sadistic Islamic regime. It is killing Sakineh little by little, to demonstrate its continued existence. Every move of this regime further reveals the depths of its savagery, the utter absence of peoples’ rights, the dimensions of the regime’s misogyny, the sheer defenseless of prisoners, the barbarity of the judiciary system of this regime, the backwardness of religious laws, and the heights of the regime’s savagery and blood lust, and – at the same time – its total impotence. It is necessary to come out with full force to save Sakineh Ashtiani and stand against the Regime of Stoning and Flogging. We have always said that as an effective step to supporting the people in Iran in their struggle against the Islamic Republic, this regime should be politically boycotted and its embassies and offices closed around the world. For years we have said this regime should be expelled from the international community, from the United Nations, from the International Labor Organization, and all other communities, and not to be recognized as the representative of the Iranian people. The time to implement these demands is now. The people of Iran do not accept that the Islamic Republic be given a podium from which to speak by any entity or government. The Islamic Republic is the shame of humanity and its leaders must be prosecuted for 31 years of daily crimes against people. 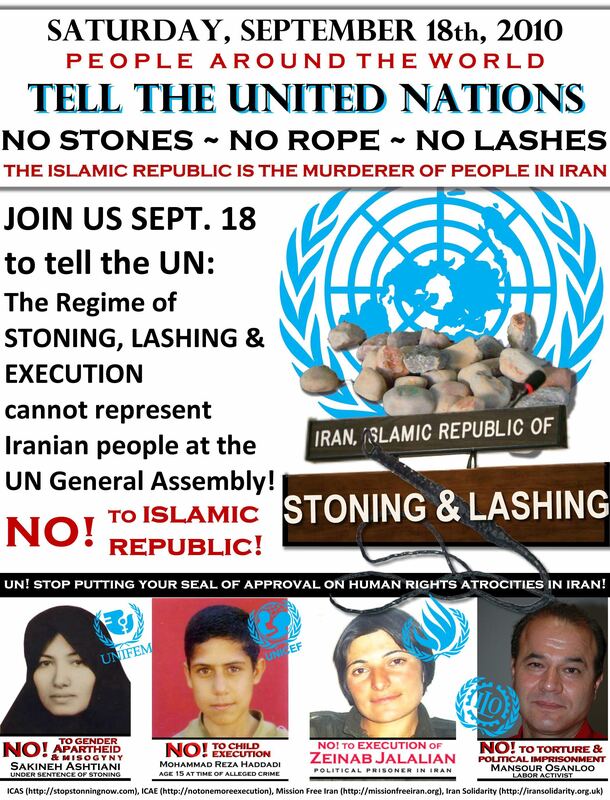 We ask all citizens of the world to demonstrate on Saturday, the 18th of September, in all cities around the world, against the Islamic Republic of Flogging, Stoning and Execution. Demonstrate and condemn this regime. Announce that Sakineh must be immediately and unconditionally free. Stoning, execution, flogging and the like all should be abolished forever. Demand that this Regime of Flogging, Stoning and Execution not be recognized and that its offices and embassies be closed everywhere. Announce that Ahmadinejad should not be permitted to take part in the General Assembly of the United Nations, from behind a podium, as the representative of Iranian people. Prepare yourself for demonstrations against the Regime of Flogging and Stoning and Execution. Tell your friends. Decide the place and time of demonstration and inform us. We know that this is short notice, but this time, we must try to have even larger demonstrations that on the 28th of August. Thanks a lot my lovely friends .